Reconsidering what constitutes a good horse diet is essential if you want to look after your horse's feet naturally, because you can no longer rely on shoes to cover up the foot problems that the domestic horse's diet often causes. Like our fingernails, the hoof is directly affected by the horse's diet, but of of course for the horse, considering the stresses the hoof is under, any negative effects on the hoof caused by the diet have much greater consequences. If you try to think about the horse's hoof with a beginners mind, it is a challenging set of circumstances that the hoof has evolved over millions of years to deal with. The wild horse requires the hoof to be constantly replacing itself - enough to deal with the wear caused by the distances a wild horse must cover in the wild to find food, water and shelter, but not so much that the foot would become overgrown, which could lead to potentially crippling problems. In the wild a horse who was held back by foot problems would become easy prey. So for a wild horse's feet to maintain themselves with just the right amount of growth versus wear is a fairly delicate balance, and an important part of this balance is the diet of the wild horses in their original habitat. The modern domestic horse may seem very different from his wild counterpart, but millions of years of evolution and adaptation to a specific environment are not undone by a few hundred years of selective breeding. Domestic horses have a very different appearance, but the basic functioning of the body remains the same, and of course the feet are part of this. So the point is that if we don't want to do damage to our horse's feet, we must try to make his diet as close to what it would be in his natural state as possible. What is the natural horse diet? Horses evolved in the plains of Asia and Eastern Europe. 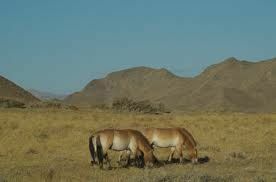 The only remaining truly wild horses in this original habitat are Przewalsky's horses, the Mongolian wild horse. This steppe or plateau habitat is characterized by vast open plains with hay-type grasses that may be abundant but have low nutritional value due to the stony, infertile ground - very different from the rich green grass that most domesticated horses graze on in America and Europe. This is why the horse is not evolved to metabolize large quantities of sugars or carbohydrates, instead they have evolved an incredibly long gut in order to be able to get every bit of nutrition possible out of forage that has a very low nutritional value. The problem with applying the wild horse diet to our domesticated horses is that in the process of breeding horses that are taller, lighter and more athletic for the various riding disciplines, and also due to their different lifestyle, they are no longer as efficient at taking what they need to maintain their condition from low-value forage, and they have equally lost to some extent the incredible physical resilience of wild horses. This is why it has become traditionally accepted that green grass, rich hay or haylage, and considerable quantities of grain are necessary to maintain a working horse in good condition. Whether or not this is the case, the high sugar content of this diet is still harmful to the feet. Actually, a high sugar-diet is bound to make the gut less efficient, and cause other metabolic imbalances - see Horse Nutrition for more on this. The sensitive laminae, which can be imagined like the glue or velcro that holds the hoof wall onto the sensitive tissues underneath, is very easily damaged by any toxin in the blood. The horse's gut not being predisposed to metabolize large amounts of sugar, if it reaches the hind gut it disturbs the balance of fibre-digesting gut flora resulting in the production of toxins. 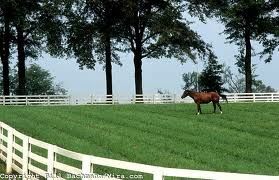 These are carried to the feet in the blood, where they do damage to the laminae - known as laminitis. This damage, whether it be to a little or large degree, causes not only increased sensitivity in the foot, but also disrupts the form of the whole hoof. 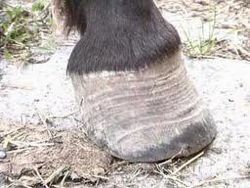 The other problem with the high sugar horse diet is that the greater level of nutrition causes the hoof horn to grow at a considerably faster rate (the cause of the rings in a laminitic foot) and as soon as the hoof wall becomes much longer than the level of the sole of the foot, it starts to flare (bend outwards) putting further strain on the laminae and eventually forcing the bones of the foot into an incorrect position. The practice of shoeing is actually a very effective way of hiding the problem of the effect of the traditional domestic horse diet on the feet. The fact that shoeing inhibits circulation and numbs the feet means that the chronic sensitivity caused by the high-sugar diet is not apparent, because the shod horse cannot feel his feet. Also shoes artificially contain the hoof wall, so that it cannot flare and break as an overgrown hoof would normally. Of course, this superficial remedy does not mean that the problem has gone away and no damage is being done, it just means that the problems will only surface later as serious and 'untreatable' problems such as navicular, pedal osteitis, and severe laminitis with rotation of the pedal bone. All of these diseases incidentally are unknown in wild horses who have the right environment, not only because they are barefoot, but also because of the healthy wild horse diet. Yes, you probably guessed it by now: cut out the sugar! Actually it's a bit more complicated than than, because, as we mentioned already, many domestic horses simply aren't 'good-doers' in the same way as wild or native-type horses are, in addition we are often placing more intense athletic demands on them through equestrian sports. However, this means that we have all the more reason to provide the horse diet that makes their gut as efficient as possible, so that we don't have to resort to sugar to provide energy and condition. Healthy and holistic solutions address issues at the source instead of trying to cover up symptoms as the conventional approach very often does. 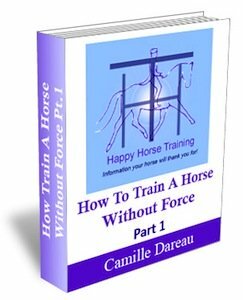 The solution that is healthy for the horse in one way, is usually beneficial in lots of other ways, setting up a positive circle instead of a negative one. 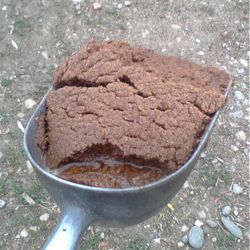 A diet based on ample good quality, low-sugar forage encourages the gut to become more efficient at getting energy from fibre instead of carbohydrates, as it creates the hind-gut environment that is suitable for fibre-digesting gut flora, instead of the acidic environment created by a high-sugar diet that prohibits these bacteria. In addition to all of this, for horses that have greater nutritional demands, we still need to find alternatives to the high-sugar horse diet. Our own experience of trying to almost completely remove carbohydrate from our horses' diet made this clear. We subsequently discovered copra (coconut meal) which provides energy through one of the healthiest forms of fat there is: coconut oil. See the Ideas in Action section of our Horse Nutrition page for a full description of our experience of finding the horse diet that provides enough energy but is low in sugars. Aside from its low sugar-content, we think that copra is directly beneficial for hoof horn quality due to its high content of healthy oils. Having personally trimmed our horses feet over the whole period of changing their diet and introducing copra, I have seen a significant improvement in the elasticity and resilience of the horn, and I am sure this has a lot to do with the the fatty acids provided by the coconut oil, which are required for healthy horn growth. Coconut oil is now available as a supplement for horses from Stance Equine in the UK. Is it necessary to provide supplements in the horse diet for healthy feet? If you start researching the nutrients that are required for healthy horn growth, you quickly accumulate a mind-bogglingly long and complex list of substances, many of which are available as nutritional supplements, such as methionine, selenium, biotin, and so on. You would start to wonder how the wild horses get along with such healthy feet on such a sparse diet… In fact all of these substances are available, in the right balance, in the natural diet of low-sugar grasses, other plants and shrubs that horses naturally browse on, and natural mineral sources. The fact is that it is dangerous territory to start adding these nutritional supplements into the diet separately. We humans have a tendency to think that more is always better, but almost all of the nutrients required by the feet, including trace substances such as copper and selenium, can have very damaging effects on them if too great a quantity is consumed in the horse diet. On the other hand it is true that we cannot always provide for our domestic horses the kind of grazing that the ideal wild horse environment gives. Often our pastures are devoid of a natural variety of herbs and grasses, and the soil may be depleted of the minerals that the horse requires. This is why we give our horses bee pollen as their only nutritional supplement. It contains an incredibly rich array of trace substances and natural enzymes, and most importantly has its natural synergistic make-up intact, unlike synthetic supplements which are much more disruptive to the body's finely-tuned biochemical systems. 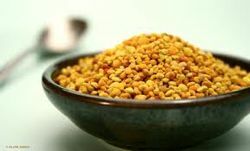 Look at Horse Nutrition for more about bee pollen. The point here is that usually, in giving supplements for hoof problems, horse owners are trying to address the wrong issue. Often the source of the problem lies in shoeing, an unhealthy lifestyle or a high-sugar diet. It is only once these issues have been addressed that we can go on to consider supplementing the horse's diet as a necessity. 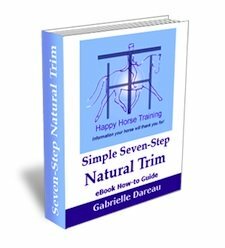 But like everything natural and holistic, the right horse diet is usually simple and straightforward, and it is your own intuition that tells you that it is healthy for your horse. To share your own Barefoot horse story, and read other people's, go to: The Barefoot Horse Revolution: Share Your Story!